Be the first to hear about their new releases and deals. 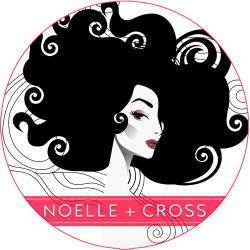 Download the Booksprout app and search for Noelle Cross today! Noelle Cross is the author of dark fantasies that explore the line between desire and fear, treading dangerous paths and letting the darklings out into the light of day. She’s obsessed with the sexuality of deadly things, and loves exploring why we’re so attracted to villains, bad boys, and tortured antiheroes with skewed moral compasses. She will always choose Hannibal over Will, and Loki over Thor. She stans for Dexter, and is fascinated by the TV series that slowly chronicles young Norman Bates’ emergent sexuality, sexual deviancy, and violent behavior. She also never said she wasn’t a little messed up. But shh. Don’t tell anyone. Every twisted vixen was once someone’s innocent little girl. She’s also obsessed with crocheting, herbalism, and yoga—even if her downward dog is usually a little closer to a downward donut. Find out more about Noelle and follow her blog at www.noellecross.com!